In this interview, Sevan Deyirmenciyan tries to explain the identity fundaments of Istanbul Armenians and their relations with religion, Armenian language, Islamized Armenians and Republic of Armenia. How is the Armenian identity perceived in Istanbul-Armenian community? What is the identity of an Armenian? I'm not the one who represents Istanbul-Armenian community and, thus, based on my observations, I can speak using generic language. By saying community we draw a certain identity borderline. According to the mentality ruling in Turkey and the way Istanbul-Armenian community is perceived, identity is rather a religious term, and the community is assembled around the church. 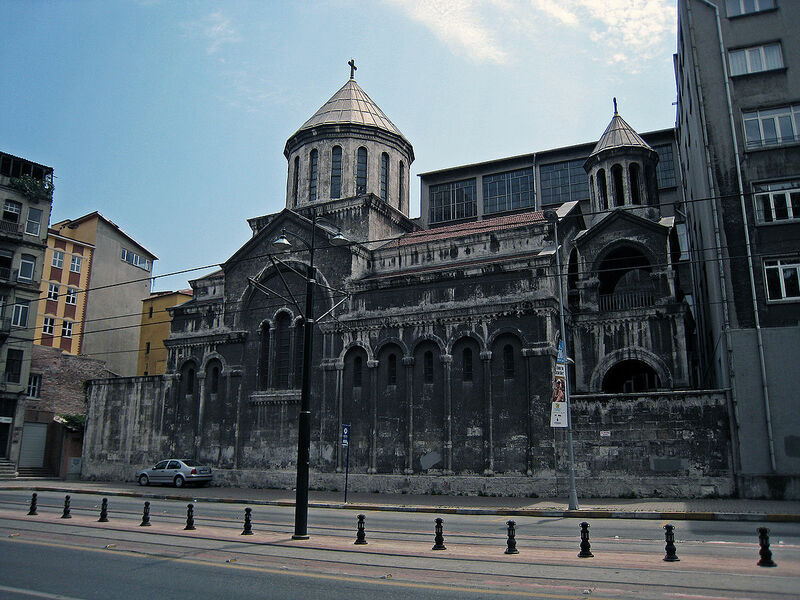 If asked, Istanbul Armenians will say that the church is very important for them and even if they are faithless, Christianity makes the part of their identity. Therefore, religious identity — and for some the language — is an important part of the common identity. On the other hand, the issue is problematic, since the term “Istanbul Armenian” — if we rummage — will reveal quite different terms. For example, I do not go to church, I am not a believer, and if I am asked about Armenian identity, I will think differently. What is identity for them in general? Istanbul-Armenian community hasn’t been thinking much about it. There are some traditions and limits they live with, but if they are asked why they do this or that thing, they will find it difficult to explain. These topics are alien to their mentality and I do not think they can explain what identity is. In recent years, the Armenian press of Istanbul in particular, has been voicing the erosion deepening day by day. Is this conscientious erosion or a lack of realizing one’s identity? I'm against the expression “erosion of identity”, we should rather speak about the change of identity concept. For instance, if we look through the pages of the press dating back 100 years, we’ll look at it differently; the press of 40s and that of today’s will also show erosion, and even a hundred years later we will speak about erosion. This is the way of complaining irrelevantly. Simply the concept and definition of the identity is changing. For instance, my parents had the following understanding about the community I was born in – after you are born you get baptized, attend Armenian college and high school, and then — after leaving high school — become either a teacher or work in the gold market. Then you have children and the same process recurs. They participate in the gatherings of community unions and speak Armenian. These people that say that the community is being subject to erosion. The reality is quite different when you look at the picture on the other hand. The community, which had such borders, considered foreign those Armenians who did not speak Armenian, did not participate in the events of the alumni associations or did not go to church, as well as those who got married with persons of other than their nationality. We have spoken about the Armenians who seem to be foreign. Perhaps, at this point, it would be right to speak about crypto-Armenians. How do they treat those Armenians? Armenians, who are imprisoned within the traditional borders of Istanbul-Armenian identity, do not accept the Armenians other than themselves. They do not accept the Armenians living in Armenia either. When Istanbul-Armenians used to visit Armenia during my student years in Armenia, dictated by their identity they would visit Echmiatsin, Matenadaran and other destinations. And when they saw the Armenians living in Armenia not going to church or other historical sites regularly, they would say, "What Armenians are they?". When talking about such people, this is the reality of identity - if you do not go to church or speak Armenian, you are not Armenian. Or, if you go to church, but you do not speak Armenian quite well, you are also Armenian. In fact, Christianity is priority for them. It is clear that crypto-Armenians will never be accepted. In the article "Armenia-Diaspora Relations: Who is Ari?" you have written that whenever Istanbul-Armenians visit Armenia on their own initiative or during the events — including Pan-Armenian Games — organized by state institutions, they always face problems. You point out the language as the main problem. Are there any problems other than the language, which may cause such serious disagreements? Language is the first problem, because first they hear language and it is the means of communication. Thereafter, when that barrier is overcome, they socialize either in English or in Armenian. However, another question arises – notion about the Turk. The Armenians living in Armenia, Diaspora Armenians and Istanbul Armenians do not have the same approach to the Turkish identity. For Istanbul Armenians the Turk is not a homogeneous mass, as it has been perceived many times, say, by the Armenians living in Armenia. It is an artificial identity and, in the case of digging deeper, diversity is evident. This is also a matter of conflict. We have witnessed the same situation when Syrian Armenians came to Armenia. They mostly communicated in Arabic whenever they wanted to speak to each other quickly or to speak secretly, which was also a counter-reaction. The same is true for Persian. The Armenian society seems to have problems with Eastern languages. It’s a fitting observation. Yes, the Armenian society is a homogeneous mass, foreigners are not welcomed there. It is conservative and sometimes even has reservations about Diaspora Armenians. Istanbul Armenians are used to speaking Turkish with each other. Once when I hosted one of my friends in Armenia and we started speaking Turkish, one of the Lebanese Armenian friends said, “At least, don’t speak Turkish in Armenia”. This is exactly the same behavior Turkey has, when you forbid or consider unwelcome other languages — this cannot be conformable to the democratic Armenia I have in my mind. Don’t you see any similarity between the attitude the Armenians living in Armenia have towards Diaspora Armenians and that of the Istanbul Armenians towards crypto-Armenians? A truly good observation and I think this is a syndrome that pertains to all Armenians. We are used to saying “What Armenian is she/he?” Fine, if he, she or that other one is not Armenian, then who is Armenian? Well, who is Armenian for you? What is your definition of the Armenian identity and what place does the language take therein? As a philologist, for me language is one of the most important components through which you convey your identity. Nevertheless, I do not blame those who do not speak Armenian. When I read and understand a work of literature dating back to the fifth century, I feel the connection coming from Mashtots very strongly and get happy from this feeling. The language also has a cultural influence, which is very important. At the end of my studies in Armenia, I was asked what I felt. My answer was short: “I came as an Armenian and became a human being here”. In other words, the factor of Armenia was very important. But Armenians from abroad are making extra effort to emphasize their Armenian identity. They are obsessed with showing their identity. It is very important for the identity of non-native Armenian to differ, to be different. Why doesn’t it work in the Armenian community of Turkey? Do they prefer not to arrest one’s attention? The language is retreating, but the difference is made through being Christian or through cuisine. Turkey is my country, but not the way the Turks perceive it. The state, proceeding from the political or historical developments, dictates to its citizens a Turkish identity, which is either accepted or not. It is fashionable these days, you know, to have a Turkish identity with the Ottoman-Islamic coloration. But for Armenians in Turkey or other peoples, this can not be acceptable. The Turkish Armenians respond to this Islamic tide by clinging to their Christian identity. Therefore, in the identity of the Turkish Armenians an important spur is the counter-reaction, that they give to the definition of the identity dictated by the ruling Turkish state. Since we touched upon homeland, do you consider Istanbul Armenians to be Diaspora? I have been thinking about this issue for many years, many thoughts have come to my mind but I am still pondering. However, as at this moment my answer is the following - since Istanbul is a plot of land, which is beyond the borders of Armenia and has never made a part of historical homeland, hence, yes, it is outside of Armenia and it is Diaspora. But Istanbul Armenians are the Diaspora of a country that no longer exists. I can definitely state that we are not the Diaspora of the Republic of Armenia. I adore Armenia, a part of my culture is kept and went on growing there, but I have nothing to do with that country. Today's traditional Diaspora, which Armenia is trying to rule, does not belong to it. That is, you don’t see Armenia as the homeland of all Armenians, do you? Yes, it can be said so. For example, the “Ari Tun” (Come Home) program organized by the Ministry of Diaspora of the Republic of Armenia should be for the children of migrants having migrated from Armenia in the 90s, because Armenia is the homeland of their parents. I love Armenia but it is not my home in my identity. In Turkey you are always reminded of your Armenian identity. In Armenia, I felt that I am a Western Armenian, I am different, and, hence, belong to another place and Armenia is not my home. People get horrified when they hear such things, but I think I don’t say bad things and I don’t insult anyone. The language is dying in the community, meanwhile the study of the Armenian language has become increasingly popular in recent years. Let's talk about the state of teaching Armenian, what level has been reached? First and foremost, a language is a means of communication for me. For example, depending on what language you speak to your mother from the early childhood, say, Armenian, German or Turkish, you will continue to use that language until the end of your life. In Turkey, Turkish has long been the language of communication also for Armenians, even for those Armenians who stress the importance of the Armenian language or express their concerns. Thus, in this case Armenian language seems just an illusion. Yes, the language is important and I feel sorry for those young people who cannot understand and are cut off from Mashtots's massive heritage accumulated by our nation till now. "As I am Armenian, I must speak Armenian" approach is a sort of nationalizing the language, this is a nationalist approach. Turkish does not belong only to the Turks and it was one of the languages ​​of the Armenians. During the Ottoman Empire also the Armenians would speak Turkish. Of course, the importance of the language is addressed, but only in the classroom. They speak Turkish even in the classroom. There is a lack of the Armenian language teachers and not only. There should be a connection with the language inside the family, children should realize that they should speak Armenian with their parents. Long ago there used to be a habit of speaking Armenian in churches, and now even the clergymen do not master Armenian. On the other hand, the issue is not only about mastering Armenian, but also about using the language in everyday life. Shahan Shahnour noticed this still in 20s, when he said “the language is retreating". This is a natural course, but it does not mean at all that we should be the grave-diggers of the language. Unfortunately, the Armenian language has yield its positions as a language of communication. Even the teaching of Armenian language is not a salvation. Armenian as a learning language can be learned at the academic level. But making Armenian a language of communication is quite another issue. Why don’t they prefer to communicate in Armenian? During the years of teaching Armenian, I used to ask my pupils quite often when they stopped speaking Armenian. Everybody answered that it was after they completed secondary education. That is, the word stock was no longer enough for them to communicate thoughts after completing secondary education. For Istanbul Armenians the Armenian language is a "sacred sanctuary". Pupils are educated to pray in Armenian, communicate in the church, but in everyday life, say, they cannot declare their feelings. It is not about that they cannot, simply they are not allowed to. Do you get the picture? Because declaring one’s feelings is a common thing for which you do not need to use Armenian. The young do not live within Armenian, this is the problem. Unfortunately, teachers do not live within the Armenian language either. I do not blame them, it is very natural, simply the right diagnosis should be given so that it is treated in the right way. If we try to treat this way and approach the Armenian language only as a sacred thing, then nothing will change. Irrespective of the mistakes made, children should be encouraged to speak Armenian. In everyday life they should be able to talk about everything and think Armenian. I always tell my pupils to write and speak Armenian, even if they make mistakes. It's better to write with spelling mistakes than not write at all. Of course, teaching Armenian is a good thing, but it's not a solution unless the mentality of doing everything in Armenian is established. Istanbul Armenians have the basic knowledge to speak Armenian, but they seem to have no desire to. But this is not the case for crypto-Armenians, it is quite different. Let's talk a little about the method you suggest to teach Armenian. The desire of crypto-Armenians to speak Armenian is understandable. It is a years-long homesickness and they justifiably think that the Armenian language makes a part of their identity. Speaking Armenian will make them more Armenian-like. They get baptized to become Christians, since Armenians are Christian. I teach Armenian as a spoken language. Pupils learn Armenian the way a baby learns to speak and then, when they manage to express themselves in everyday life, they can learn the language on the professional level. I even tell my pupils to write in Latin letters if they find it difficult to write in Armenian letters, the only aim is to think Armenian. This is perhaps the most important thing. Today, many young Armenians do not speak Armenian because of fear of speaking with mistakes. The classic character of a Istanbul Armenian has set itself within limits, also restricting the Armenian language. If Mesrop Mashtots heard our today’s Armenian, he would have got much disappointed, because our today’s language is a big mistake as compared to the language of the 5th century. But what should we do? Should we stop speaking? Language is a developing organism and is changing day by day. The search for identity in Dersim Part 2: the Alevized Armenians in Dersim. Turkey-Azerbaijan: “One Nation, Two States”? Armenia-Diaspora Relations: Who is Ari? Turkey, what future for a split civil society? Which future for the city of Diyarbakır?